So I stumbled upon something beautiful. I love a good B.L.T. I usually add avocado and leave out the mayo. Since I had a surplus of peaches, I made a B.L.P. 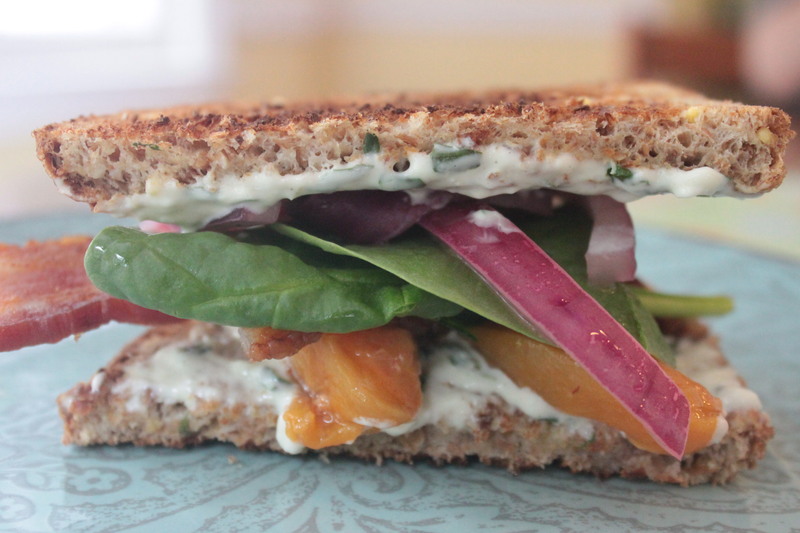 The peaches made these fantastic, but the dressing is what really made this sandwich amazing. Even Silas, licked his bread clean. The beauty of this dressing is its tang. 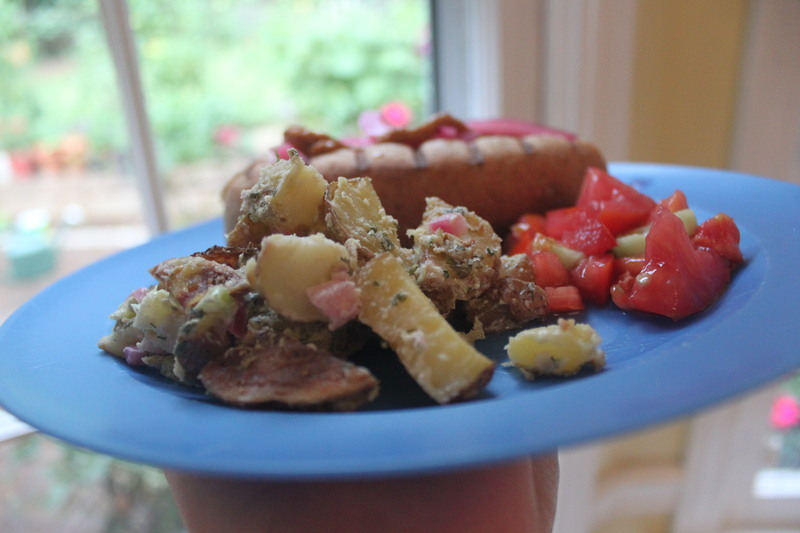 Tonight, I topped roasted potatoes with it and made potato salad. 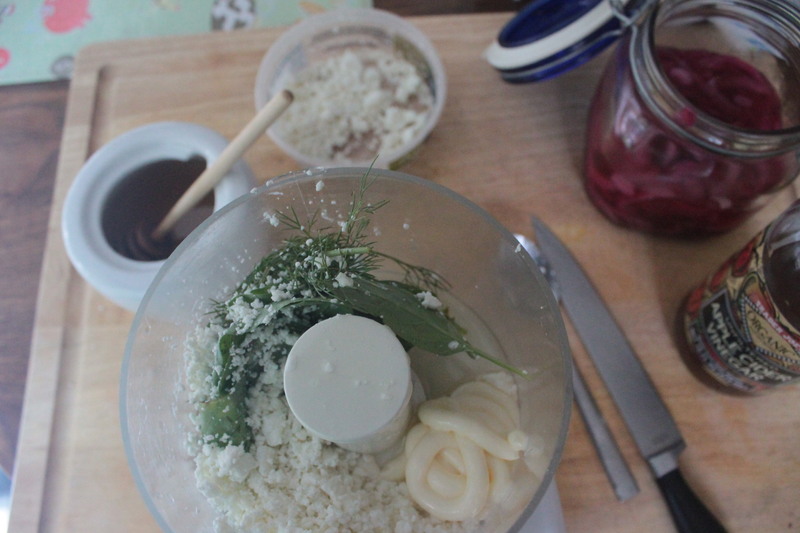 In a food processor, combine goat cheese, basil, dill, mayo, salt and lemon. Pulse until a smooth consistency. Spread goat cheese spread on all 4 slices of bread. Evenly distribute the remainder of toppings and enjoy! Heat oven to 425 and roast potatoes with the olive oil for 20 minutes until golden brown. Meanwhile prepare the celery and pickled onion. Add the potatoes straight from the oven to the celery, onion and dressing. Eat hot. Combine all ingredients in a food processor and pulse until smooth. If you want the dressing, to be thinner add more vinegar. Wow Tara! wish I lived closer- Sounds awesome.